Join a like-minded local to explore Uppsala, a historic city that’s just a 40 minute train ride north of Stockholm. With Viking and Medieval roots, you’ll discover fabled, royal burial mounds, a university which was founded in 1477, the oldest Gothic Cathedral in Scandinavia and museums and galleries that are packed with fascinating culture. 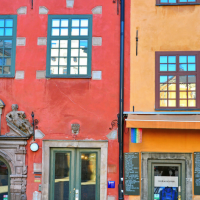 Cosy up for fika in one of Uppsala’s many coffee shops, stroll along the river towards the city’s historic districts and, visit the castle and discover a 400 year old anatomical theatre. With just one day to explore and a local by your side, you’ll be able to make the most of the cultural and historic gems that Uppsala has to offer! After stepping off the train, enjoy coffee and pastries at a tiny coffee shop which serves some of the best espresso in the city! Then stroll along the riverbank and down the cobbled streets in this cultural area. Explore the city and visit its most famous landmarks, like Uppsala Cathedral, which is the oldest Gothic style castle in northern Europe, and the castle that’s perched on top of the hill, before you enjoy a tasty lunch at an authentic local restaurant. You may want to take the short bus journey to Gamla Uppsala, which is the ancient pagan part of the city, where you can still see the Viking royal burial mounds; there are three barrows which date back to the 4th century, as well as the burial places of the gods Odin, Thor and Freya. Before taking the train back, you may like to browse in the unique and quirky shops, or visit the Linneaus Museum and botanical garden. This is an important cultural and scientific landmark, as Carl Linneaus, whose home the museum is located in came up with the scientific classification for naming species of plants and animals. I run a small bakery back in the US so I came to Stockholm with bread on the mind. I spent days exploring the best of bakeries in Stockholm with a Local, and I was recommended to go to Uppsala for even more authentic bakeries. I got in touch with CityUnscripted again and they organised this day for me with James my guide. After walking through he main highlights and a few independent galleries, James took me to one of his favourite bakeries, Güntherska Hovkonditoriet. Obviously, I was in my element. I'll never forget their kanelbullar. Tack James!